Yeah...finally reaching 100 Thai food recipe. Not easy and very hard for me...but it's ok I'm happy to make it. Well, hot and spicy food is normally on the table of every meal in Thai house, particularly at dinner, the biggest meal of day. 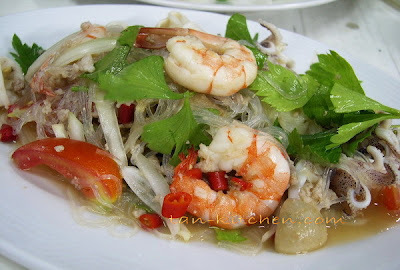 And Thai Vermicelli and Seafood Salad or Yum Wun Sen Tha-lay is all day dining. It’s healthy and low fat. You can make it less spicy or more spicy as you wish. In Thailand famous for party time also. It’s is favorite Thai spicy salad one. And very easy to make it. Wanna try?? Mix all ingredients in a big bowl, then season with fish sauce, sugar and lime juice . Serve immediately with fresh vegetable such as cabbage, cucumber, string bean, etc.